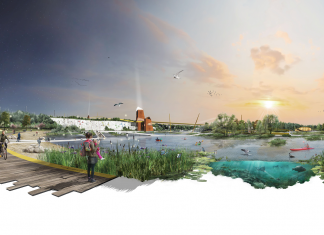 After a design competition run by the Landscape Institute in 2009, winning design company Tonkin Liu was set to see their design become a reality. A little over a year later and the Dover-front’s project; Lifting Wave, Resting Wave and Light Wave, is set to open this week. This is a repeating set of ramps and staircases made of pre-cast white concrete that rise and fall connecting the esplanade to the shingle beach. A gully side-ramp collects all the water runoff. A sculptured retaining wall that runs the length of the esplanade is designed to prevent fly posting and tagging. This area also features weathered oak benches designed to resemble driftwood. This is a sculptured wave of white columns lit up by floodlights while mini spotlights illuminate the decorative ‘froth’ of the wave.